A market hall will replace the current market building, whilst maintaining its modern charm. The market is expected to draw a footfall of 25,000 visitors per week. A 103,000 sq ft office and administrative facility for 1,100 employees at Warrington Borough Council. A new state-of-the-art, 2,500 seat, 13 screen Cineworld multiplex cinema as anchor tenant. A new foodie haven for Warrington’s many families and young professionals. A new public square, perfect for attracting events, pop-up retail opportunities and experiential marketing. A new 1,160 car space multi-storey car park, to serve the scheme and the wider Warrington town centre. 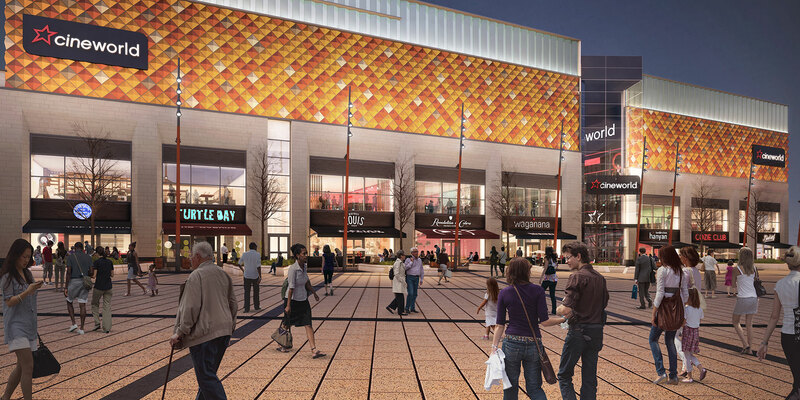 Cineworld will be the new movie operator and anchor tenant at the heart of Time Square. A brand new 2,500 seat cinema will be constructed to Cineworld's latest state-of-the art specification which the operator says will set new standards and further improve the experience for customers. The multiplex will offer a next generation cinema experience, anchored by Cineworld’s unique Super Screen theatre which gives a brighter 3D experience and multidimensional sound. Cineworld Group plc was founded in 1995 and is now one of the leading cinema groups in Europe. It is the second largest cinema operator in Europe with 2000 screens in 9 countries.